Jen at Timballoo hosted this month's CPSH. This was Sunday morning in Tignes. Quite a shock as it had rained most of the day Saturday and only snowed a scant inch by the time I went to bed! Anyway. 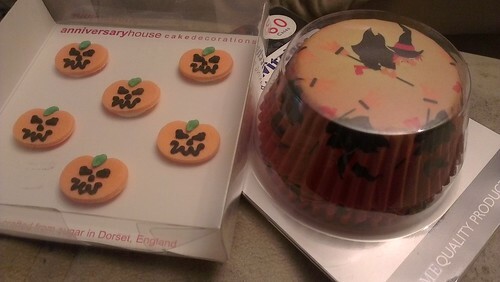 As the weather has been getting chillier and the nights drawing in (which, by the way, I love) I have been more inspired to knit than ever, and also to experiment with new recipes for cakes and warming soups and stews and the like. No chutney this year, sadly, though I could do that at the weekend. It has been long in the making. 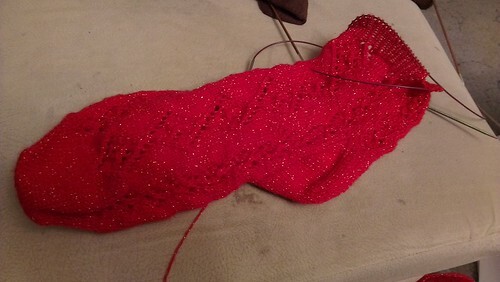 I started it as plane knitting when I went to Malaysia in November, 2010, and had got as far as turning the heel by the end of summer 2011. I decided another Christmas could not pass without these socks to wear. 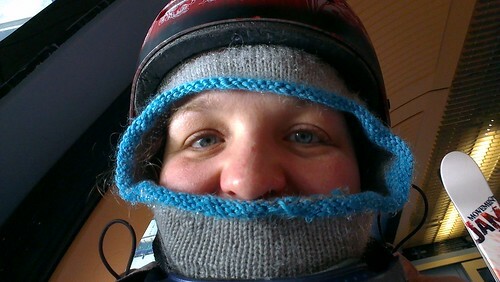 This really is the perfect thing to wear under my helmet when it is especially cold. Really need to knit myself a new one now I have cracked how to do the face hole properly, though. 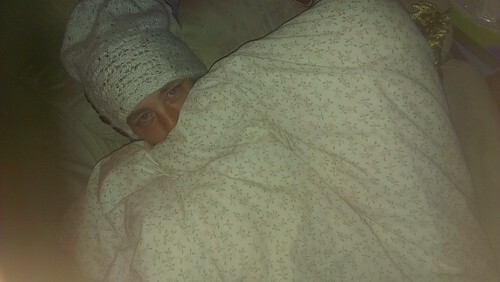 And here's Mr Z, looking considerably cosier than me! - and wearing my hat. 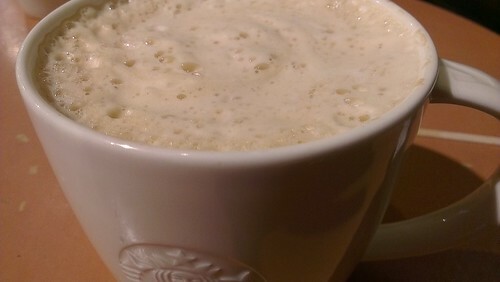 And finally, a pumpkin spiced soy misto in Starbucks this afternoon - perfect for waiting out today's squally weather. 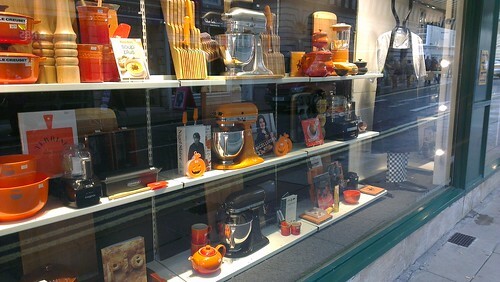 The current window in Kitchens, a favourite cookware shop in Bath. I am thinking of buying a Kenwood Chef. I have some money leftover from the summer exams, even after I have paid off the credit card, but it is a big splurge and I am sort of waiting to see if any unexpected bills arrive. Enjoyable topics, thanks Jen! Looking forward to next month. Gosh, look at that snow! Beautiful. I can't believe that's your first sock! You're such a nifty knitter I just assumed you must have done loads of them - I'm looking forward to seeing how they turn out (and maybe next year I'll have a bash at making some, miracles might happen! ).